The LiteW8 Panel system offers significant advantages in construction and cost for builders and developers. The system is comprised of Autoclaved Aerated Concrete (AAC) that may be used as the external or internal wall cladding panels for residential, commercial or industrial buildings. It may also be used for flooring in some residential applications. AAC consists of a combination of lime and/or cement combined with finely divided sand and other filer materials. This is cured under high pressure and temperature to provide a relatively strong, lightweight cellular structure, incorporating small uniformly distributed bubbles. This structure results in the unique properties of lightness, high thermal resistance, workability and strength. Clean site – LiteW8 Panels produce very little waste which provides a more efficient site for all other trades. This also gives you the builder some substantial cost savings by needing less skips onsite and less time wasted filling and sorting any skips. 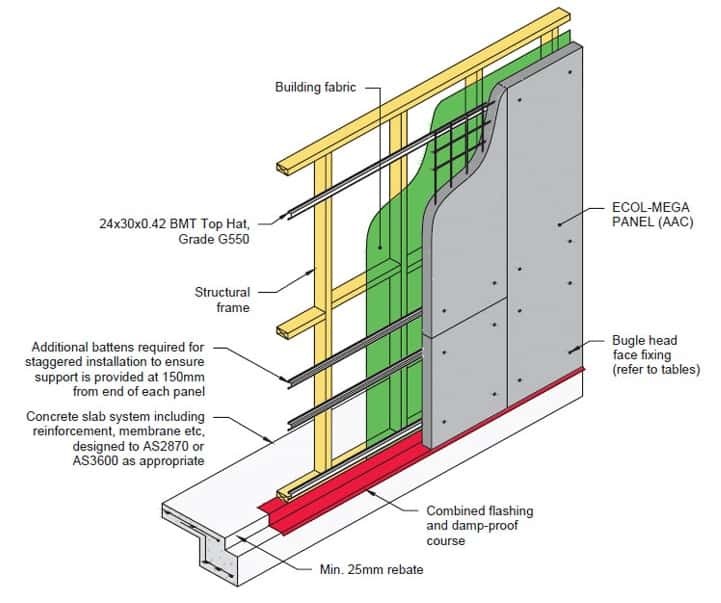 The following specifications and details are generally suitable for Reinforced ECOL-MEGA PANELS (AAC) wall cladding for domestic dwellings, subject to confirmation by the Design Engineer. A suitable support framing system must also be provided. The spacing of the battens/ brackets and number of fixings increase for higher wind loads. ECOL-MEGA PANELS (AAC) panels within 1,200mm of each end of each external wall of a building (i.e. the two 600mm wide panels closest to the corners) are subject to higher local wind pressures and suctions, and therefore require reduced batten/bracket spacing and more screw fixing than the other panels. Unless specified otherwise by an engineer, the following details and tables shall be used for the cladding of domestic dwellings with 50mm, 75mm or 100mm thick Reinforced ECOL-MEGA PANELS (AAC). If ECOL-MEGA PANELS (AAC) are required to provide racking resistance, the screw and supports shall be determined by the structure engineer, taking into account the wind classification and the overall building dimensions. Housing construction approvals are at 19-year high. There were over 188,000 home building approvals in the 12 months from March 2013 to March 2014, the highest rate since 1995 and 20 per cent higher than the year before. “The underlying strength in building approvals continues and should help sustain growth in residential building” Wilhelm Harnisch CEO of Master Builders Australia said. Commonwealth Bank senior economist Michael Workman said that the housing construction sector looks ready to be the main driver the Australian economy when mining investment winds down. “There is still a significant boost coming to construction and spending” he said. Mr Workman said the strength in housing will help employment growth. We expect to see sharp rises in the construction activity data in coming quarters,” he said. Housing Industry Association chief economist Harley Dale said home building will be a major boost for the economy in 2014. “If you’re searching for highlights to the Australian economy, new housing is the best shot you can take” said Michael Workman. “Approvals for detached housing are forecast to show continued further growth largely as a consequence of the undersupply of housing and the low interest rate outlook,” Wilhelm Harnisch said. “That having been said, multi-unit approvals hit a record high in the December quarter last year. “Overall, the latest data is consistent with the good pipeline of work that underpins the industry’s confidence in forecast growth in the residential building sector,” Wilhelm Harnisch said.